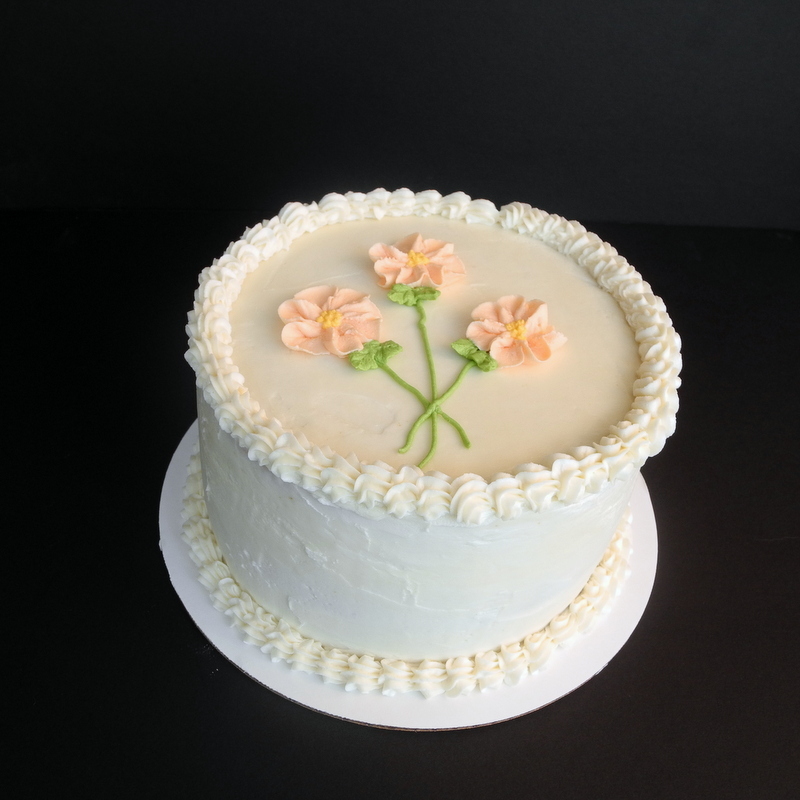 I made this cake for my mom for her birthday. It is a vanilla cake using the same recipe I used for these vanilla bean cupcakes. I know she loves peaches, so I filled it with homemade peach filling. And, then I frosted it with a quick butter cream that she always says tastes like ice cream. 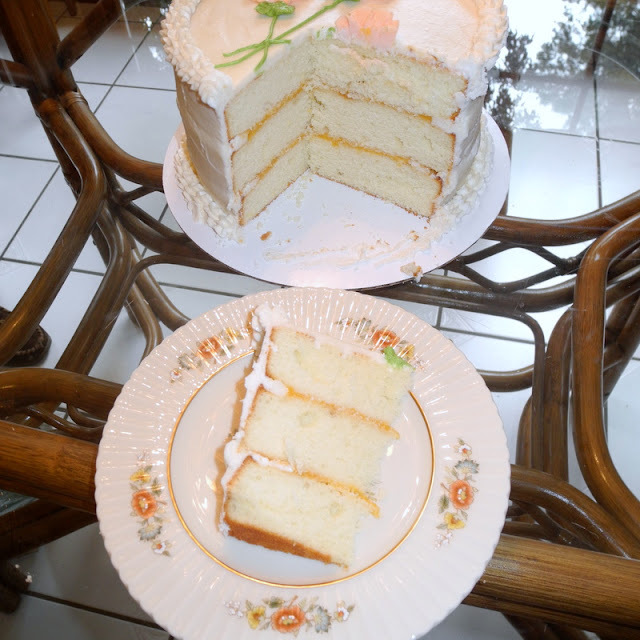 I originally got the recipe for this cake off from Annie's Eats , where it was used as cupcakes. I liked it so much as cupcakes that I decided to turn it into cake. The filling is one I came up with on my own based on numerous fruit filling recipes I have used and seen over the year. I pureed the peaches and just kept adding sugar, a little at a time, until I got the right sweetness. And then, cooked it with cornstarch to thicken it. I think you will love it as much as I did! Pre-heat oven to 350 degrees. Butter and flour three 8 inch cake pans (at least 2 inches deep). I also line mine with parchement and butter and flour it as well. Slice the vanilla bean in half lengthwise and scrape out the seeds. Cream together butter sugar and vanilla bean seeds with an electric mixer until light and fluffy. Add eggs one at a time mixing after each addition. Add vanilla, baking powder, and salt and mix until evenly distributed. Add the flour alternately with the buttermilk, mixing well after each addition and beginning and ending with flour. Evenly distribute the batter into the the three pans Bake for about 30 minutes or until a wooden pick inserted in the center comes out clean. Allow to cool in the pans on wire racks for about 10 minutes. Remove from pans and allow to cool completely before filling with peach filling and frosting with vanilla buttercream. Spread filling on one layer. Top with the second layer and spread filling on it. 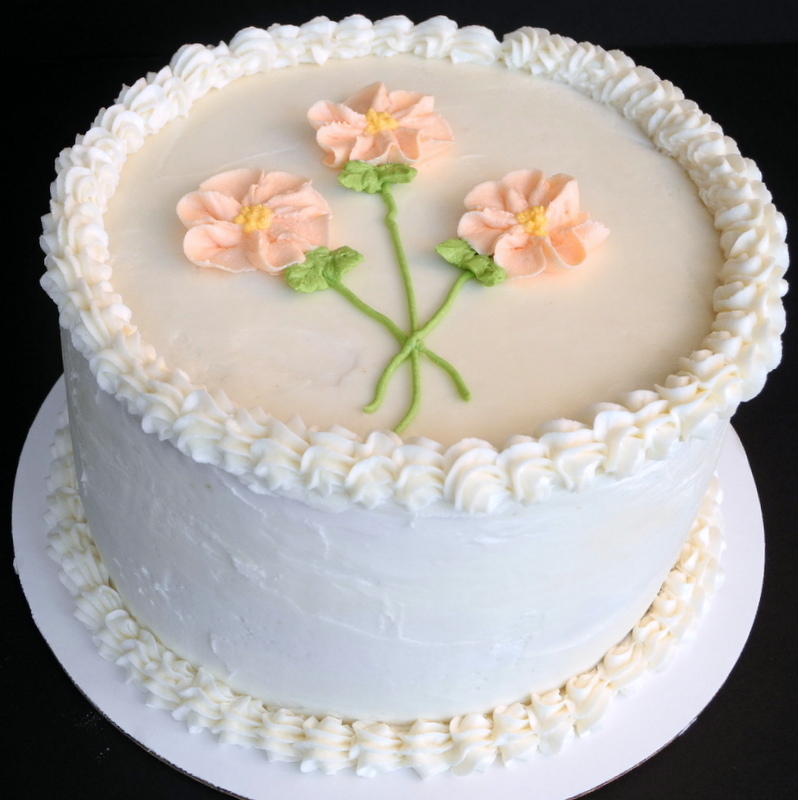 Top with the third layer and frost with vanilla buttercream. Garnish as desired. Puree peaches in a food processor or blender. Combine with sugar and cornstarch in a medium saucepan. Cook over medium heat until boiling, stirring constantly. Boil about 1 minute or until thick. The cornstarch will have given it a whitish look that will go away and become more translucent when it is cooked. Let cook completely before filling cake. Beat all ingredients together using the paddle attachment of an electric mixer. Frost cake. This will make too much, but I really don't like to scrimp on the frosting. Source: Cake adapted from Annie's Eats. It looks like a cake you'd get at the grocery store! Well done on all the flavors AND the decorating! Wow! That is one lovely looking cake, so impressive! Greetings from your new follower - Abby of manilaspoon.com.